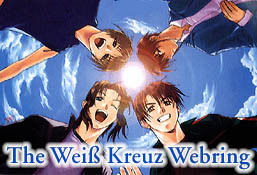 All you need to join this ring is to have a site that has Weiß kreuz material on it; fanart, info, image galleries - as long as it's Weiß kreuz and it's not so new that it has nothing but an 'Under Construction' sign, it'll do. 1. Fill out the form below to submit your site to the ring. 2. Copy the HTML ring fragment and paste it onto your page. 3. Replace "--mail-" with your E-mail address, "--name--" with your name, and all "--id--" with your id. 4. OR you can take the easy way out by simply submitting your site info first, and later use that 'Edit Site' stuff at the bottom to get your HTML fragment. 5. E-mail me at sai_jp@yahoo.com AFTER you've completed all the steps. To edit any of your site information (like you changed your URL, E-mail, etc. ), fill out the form below. This The Weiß Kreuz Webring site owned by Sai.